Small group bible studies are the best way to get to know your Lord better and His servants better too. Small group bible studies are where the Lord’s word really begins to make a difference in a person’s life. Small groups of Christians love deeper, serve each other and the Lord better, and have a lot of fun doing it. This is the best place to get to know other Christians and know God’s word for you personally. As of this writing we have four study opportunities during the week, but are always thrilled to start another one because we like to be together and like to read the Bible together. This adult group uses the most recent and relevant bible study materials available in their quest to discover God’s wisdom and direction for their lives. Teaching style in this class usually leans toward lecture with plenty of opportunity for response. This small to moderate sized fellowship of Christians lives up to it’s name as they care for each other and openly welcome new members. This group tends to be made up of professional people of various ages and experiences. Their active participation in the business world leads them to be constantly selecting the latest and finest contemporary bible studies that address a Christian’s day to day challenges. The teaching style here is very discussion oriented with the “teacher/leader” facilitating lively discussions of God’s word. This is our ladies only group, (men welcomed too). Sunday always starts for them with plenty of time to catch up on the week’s happenings and prayer for other’s needs. Then they dig deeply into God’s word using the best and most recent studies to guide them. Similar to the Loyalty Class the teaching style is usually lecture with plenty of opportunities to respond. Wednesdays are our mid-week time to focus on being together and allowing God to grow our faith. Sometimes we have several groups going in different parts of the church, sometimes just one big one. Sometimes we share a covered dish meal (pot luck) and sometimes we have a meal catered. And sometimes we don’t eat at all, (except for some tasty desert). Of course coffee is always available. Regardless of the food situation we gather on Wednesday night for some intense Bible study and prayer. Wednesday night is the night we are most likely to start new things. Wednesday night is when our youth and children are here for their mid-week fix of fellowship and Jesus. Wednesday night is always in either our Fellowship Hall or our Activities Center. We would love to have you join us! 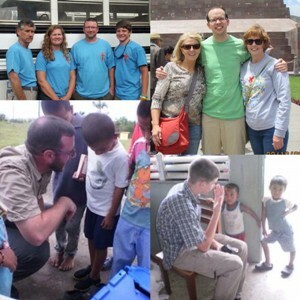 Our outreach to the world is ongoing through financial support of local and worldwide missions, as well as though mission trips and opportunities for community service. If you would like to know more about mission trips or opportunities to minister in our community talk with the Pastor. The C.P.W. welcomes the women of the church to grow and serve through a variety of ministries planned throughout the church year. To become involved talk with any lady in the church or better yet, come to one of our circle meetings. Gleaner's Circle meets the second Tuesday of each month in the church at 10:00AM. We encourage every member to have one way in which they grow spiritually in our church and one way in which they bless others with their gifts. Ministry Teams are the best and fastest way to get involved, covering everything from Children's ministry to fellowship. Ministry Teams meet on the 3rd Sunday night of each month. Through the gospel God turns everyday people into worshiping people. We worship together every Sunday morning at 10:30 with reverence and joy!